Opening Up the Creative Processes of a cover designer: Love of what you are doing or learning to do. Andrew Gibson is the CEO and Head of Development at Jellypie Software. Jellypie Software is a small software company (sometimes referred to as a Micro ISV - Independent Software Vendor). Jellypie Software specialise in making creative software tools for creative people. Their first software product, Video Fun Box was released in 2003 (http://www.jellypie.co.uk). In 2004 they released 3D Box Shot, the first commercial tool for creating visualisations of 3D Software Box Shots. This was followed by 3D eBook Shot which introduced keyframe animation to the world of virtual cover designs (http://www.3d-ebook-shot.com). in 2011 Jellypie Software released 3D Box Shot Pro, the ultimate virtual cover design tool. 3D Box Shot Pro uses hardware accelerated OpenGL Pixel shaders to generate stunning quality virtual covers. 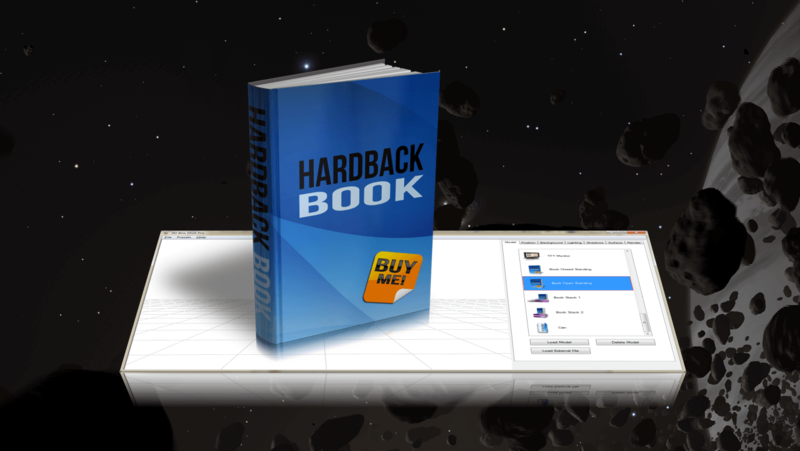 3D Box Shot Pro was used to create all of the 3D cover images included in this book. The world is full of bad cover design. This is primarily because good cover design is difficult to do and people with skills in one area (writing) tend to have limited skills in other areas (graphics). As a result, in order to save a few bucks, authors either attempt to design a cover themselves or pay a ukrainian teenager with little more design skills on Fiverr to do it for them. This is of course an insane approach to take when the cover of a book is so crucial for its marketing. It doesn’t take a rocket scientist to figure out that publishing companies have a graphic design team for a reason. They work with the publishers marketing department to create a cover that fits and resonates with the demographic that the book is targeting. The cover is important to the publisher as it will appear in the catalogues they send out and all of the marketing material they generate. The designers themselves will have spent years developing the skills required to develop professional book covers. The first option cost money. Yes, you can get a Estonian teenager with a pirate copy of Adobe Photoshop to design a cover for you. However you will get $5 worth of design, featuring stock photography and fonts with dubious origins. If you have deep pockets and a decent marketing budget for your cover then by all means hire a decent designer to make your cover for you. Just make sure that you are the one that purchases any licensed material used in the design. If you opt to do it yourself then this guide will give you everything you need to create great looking covers. It focuses in the techniques you need to make a professional cover design while showing you the common pitfalls of bad designs. It contains information on where you can legally download the software and graphic assets you need to complete a design together with instructions on how to use it. 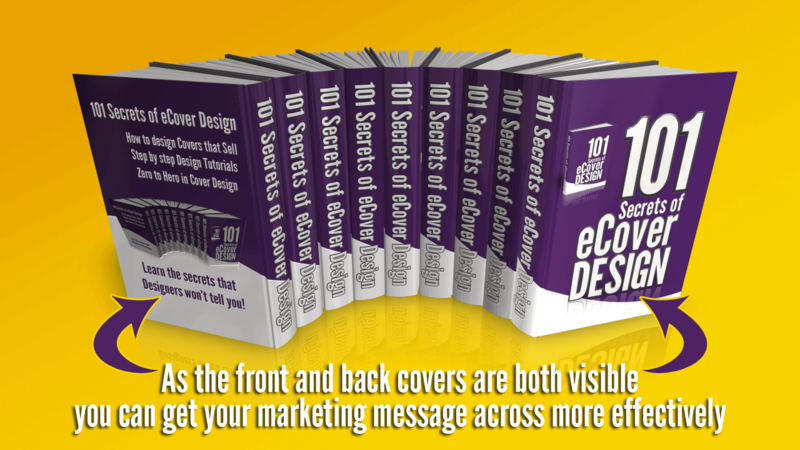 Lets start by taking a look at how you can easily create a basic ecover design using 3D Box Shot Pro and any image editing program that supports layers. The way you display your eCover can have as much impact as the design itself. This is just one area that 3D Box Shot Pro can really help as it offer a huge level flexibility in terms of how you present your 3D eBook Covers. One of the things that’s often missed is the back panel of a 3D eCover. This is primarily because the focus is almost always on the front of the design. However, the back of the book is arguably very important as this is where you can place the marketing blurb that makes people want to read the book. Think about how people select books in retail stores. Sure, the cover is what draws them in, but it’s the blurb on the back than cements their interest and gets them to buy it. If you’ve gone to the trouble of getting a book written, don’t skimp on the marketing. Give it the best chance of success. CEO of Jellypie Software. This is a short extract from Andrew's book on Cover Design. More coming soon!